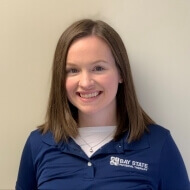 Mary Kate Grace - Bay State Physical Therapy. Mary Kate graduated from UMass Lowell in 2015 with her B.S. in Exercise Physiology with a minor in Spanish and in 2018 with her Doctorate of Physical Therapy. Mary Kate has clinical experience in both orthopedic outpatient and acute care settings. She completed her final clinical experience at BSPT Reading in winter 2018 and joined the team in spring 2018. She enjoys working with various orthopedic conditions across the lifespan. She strives to provide her patients with the necessary tools to independently maintain function and prevent future injury. In her free time, Mary Kate enjoys staying active with indoor cycling, tennis, and has recently taken up golf. She enjoys being outside and hiking, going to the beach, and traveling.